I’m constantly on a quest to find good lunch dishes that are something different than the classic sandwich. It’s a tough deal because you want something flavorful and tasty, but it also needs to be filling and healthy. If I don’t have a filling lunch, I find myself snacking on the chips at about 4PM. Ok. I sometimes snack no matter what, but it’s especially bad if I skip a hearty lunch. Quinoa has been the perfect base for my lunch salad experiments. It has a good amount of protein and fiber which will keep you full. It also has a great texture and can be thrown in with a huge list of other tasty ingredients. In short, quinoa is my salad king. 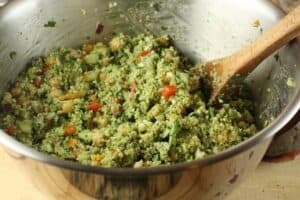 Quinoa mixed with a bunch of veggies, some feta, and a nice homemade pesto makes for a great weekday lunch dish! 1) Combine pesto ingredients in a processor and pulse until combined. 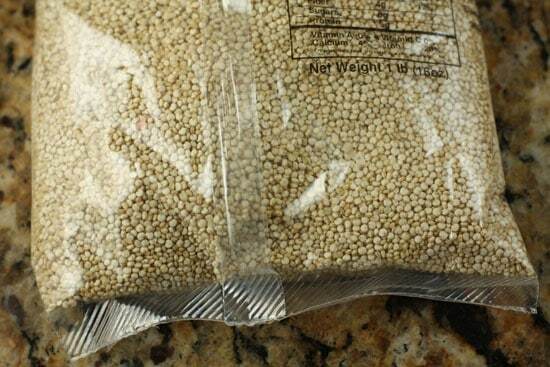 2) Cook quinoa according to package and set aside. 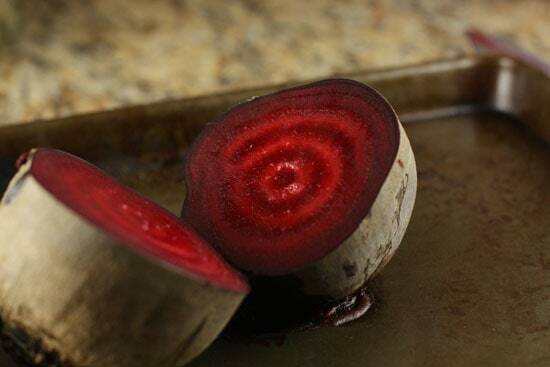 3) While quinoa cooks, chop all your veggies and roast your beet (350 for about an hour) if you’re using beets. 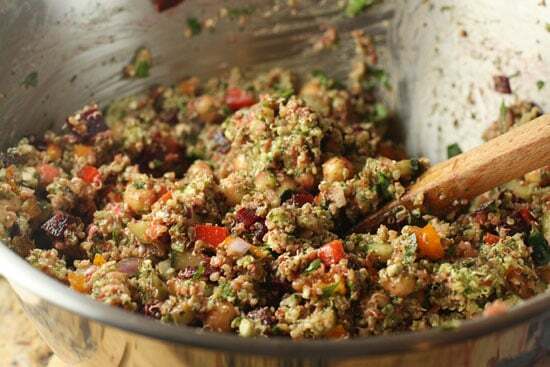 4) Combine veggies with quinoa. Crumble in feta. Toss with pesto. 5) The salad is best if you let it chill before serving. I make pesto all the time and I love playing around with the flavors. A bit more garlic or pine nuts can really change the flavor of it and make it very different. If you’re making it, don’t stress about the exact amounts. Just taste it as you go and adjust. It takes just a minute or two to toss all the ingredients into a processor and pulse it together. When I make pesto, I normally make a double or triple batch and then freeze some pesto for later. If you’re in a super-rush, you can use jarred pesto without a problem also. Cooking quinoa is like cooking a strange mix between oatmeal and beans. Basically, I just always follow the instructions on the package and it ends up being great. It’s a really flexible grain so if, while you’re cooking it, you notice that yours is a bit dry, feel free to add more water. One time I added way too much water and just strained my quinoa through a strainer when it was done and that worked great also. So, basically, it’s pretty hard to screw up. Cooking it takes maybe 15-20 minutes. It’s not too bad. If you have leftovers, this stuff freezes great actually. Just cool it down completely and then seal it in a freezer bag. Try to get out as much air as possible and it’ll keep in your freezer for a few months. Then you can just thaw it in the microwave (low power) when needed. It’s okay that the quinoa takes a few minutes to cook because you’ll have a lot of chopping to do to finish off the salad. The veggies I used in the salad are just a suggestion. I would definitely keep the onion, feta and chickpeas though. Those are really nice flavor additions. 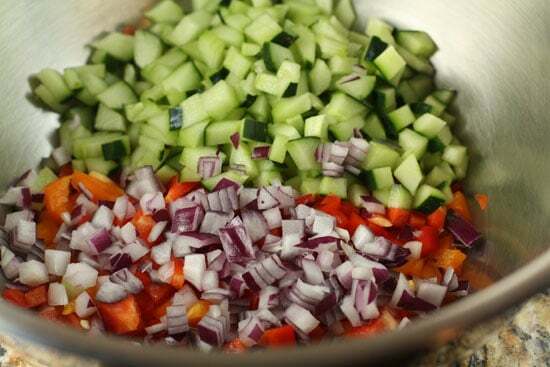 Try to dice up all your ingredients so they are roughly the same size. The onions should maybe be a bit smaller. Unless you’re an expert chopper, this will take a few minutes, but it’s worth it because you’re getting meals for days out of it. I had a spare beet sitting around so I roasted it up and included it in the salad. This is very optional. The beet added some nice sweetness to the dish which I liked but it also had the unfortunate side effect of turning the salad a kind of purple color! If you’ve never roasted a beet before, just toss it on a baking sheet and roast it at 350 until it’s very tender, about an hour normally. Let it cool a bit and then you can peel it and dice it up. A salad like this is very flexible. Start by adding your quinoa to the veggies that you’ve chopped and then add enough pesto to lightly coat the salad. 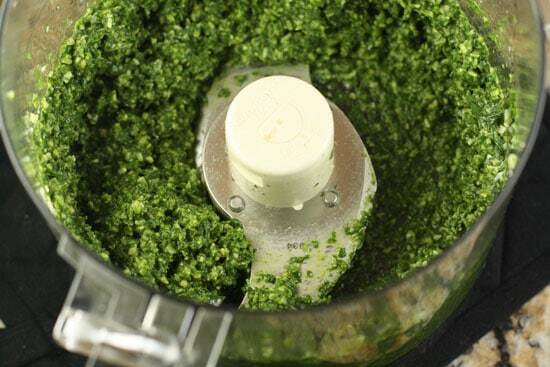 You should need about 1 to 1 1/2 Cups of pesto, but feel free to use more or less depending on your tastes. I stirred in my beet last to try to minimize the color burn, but it still turned stuff pretty red. My final salad wasn’t quite as appealing as the nice green salad in the first photo, but it tasted better in my opinion. I loved the beet addition. So let the record state that pesto plus quinoa plus a bunch of random veggies makes for a really good lunch! Nick: I couldn't find anything on here concerning "prepping" the Quinoa. Basically, it comes in two forms…"washed and unwashed". 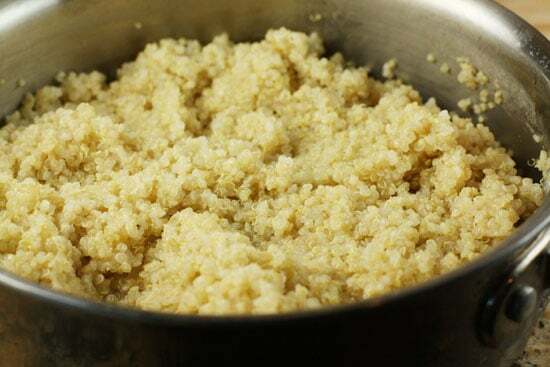 The "pre-washed/rinsed" is good for the recipe as stated, but if one purchases the "raw" or "unwashed", version, they must first rinse it COMPLETELY, otherwise, they will get a "soapy" tasting quinoa from the residue on the outer hull. This residue needs to be removed first. Great comment Larry. Thanks for noting the difference. How funny, I've made a nearly identical salad in the past. http://www.foodinjars.com/2010/04/vegetable-stuff… It's one of my favorite meals. I've read about soapy quinoa for years, but for some reason, I've never ran into a problem by not rinsing mine. It's the world's simplest grain to cook, and I've discovered it cooks up perfectly in a rice cooker. Set it and forget it. Thanks for another great recipe using Quinoa. You inspire me, and b/c of you I've throwing Quinoa into a weekly pot of Lentil-Quinoa Soup I've been making for my own lunches — very hearty, and the Quinoa adds more protein to the already protein rich Lentils. Since you bring up the point of staying satisfied a trick I use is to incorporate some Organic Chia Seeds into my salads like this one. Chia Seeds will not only fill you up, when saturated they expand 10X there own mass in your tummy. Richer in Calcium than milk, more potassium than a banana, and more iron than spinach. I have an easy source for Organic Chia Seeds and anyone can too by going to our website — just click on my name. I agree with you 100%, quinoa is the salad king. I just love it. It's so versatile. 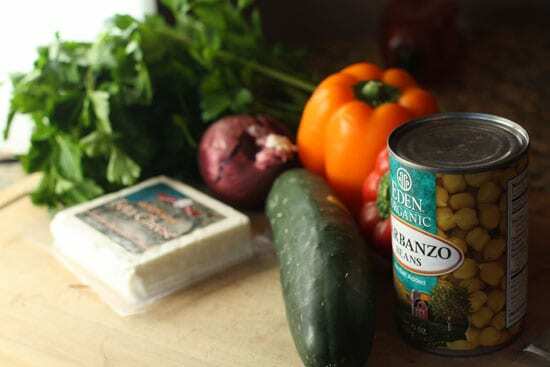 You can make great salads, soups, stews or even desserts from it. I tried quinoa for the first time just before Christmas – it's safe to say it will be a staple in my home for good. Talk about versatile!! I'm now on the hunt for recipes that cover everything you can do with it – if anyone here has links to sites (or more recipes to share) … just point me in the right direction. The best part is that it's gluten free. I don't have celiac disease, but I'm positive that I have gluten sensitivity as every time I eat breads, pasta's, etc….the bloating, gas and pain they can cause make my life miserable. Thank heaven for friends that take the time to introduce new and healthier lifestyles, in meaningful ways!